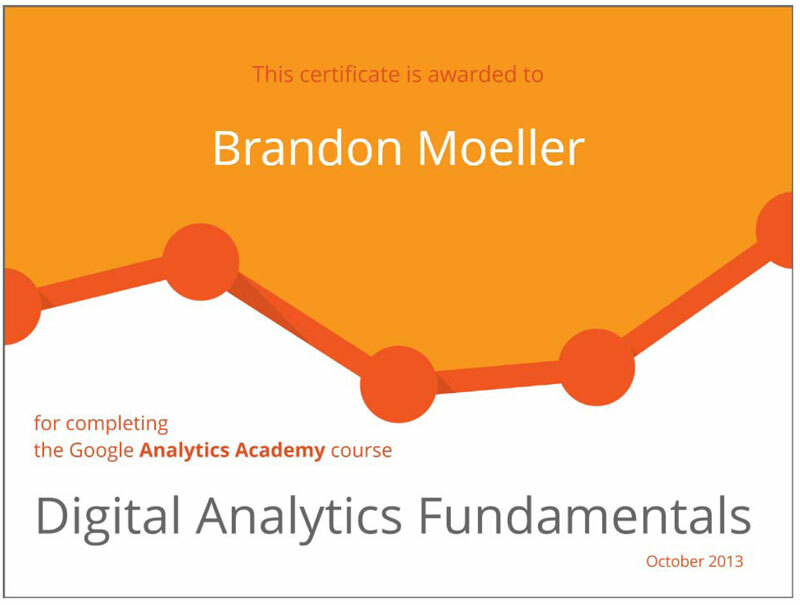 I learned a lot about the basics of Google Analytics and what the always-improving platform can allow you to do to gauge the success of a web site and the efforts of a marketing and communication team. The course consisted of six units which each consisted of a handful of subunits, each of which contained a YouTube video with instructor Justin Cutroni explaining how to set up Google Analytics, how to manage it to get relevant data for your organization’s needs and how to analyze it to improve performance. I scored a 97% on the final course assessment. 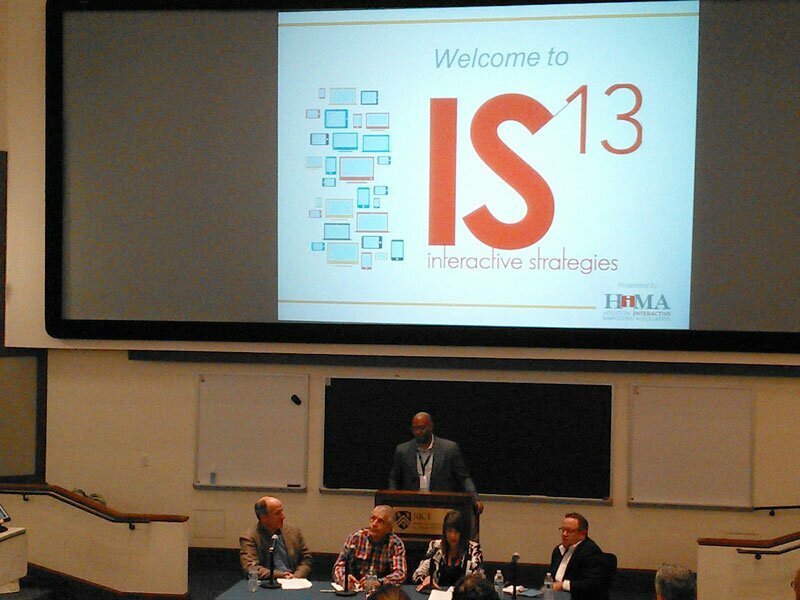 Yesterday, I attended the Houston Interactive Marketing Association’s annual conference titled Interactive Strategies 2013: Marketing in a Multi-Screen World. You may have heard about it on Twitter. It was a great learning experience and I met many people who work in the business of online marketing in the Houston area. The following is a recap of notes I took during the event. See photos from the event on the HiMA Facebook page. The photos here were taken with my Google Nexus 7.2 – the single device I used throughout the conference to take notes, photos and live tweet (@uhbauerredesign). So, yeah — the photos are kind of blah. Tae E. Kim, Head of Channel Partnerships in North America at Google, was the keynote speaker at the conference. His talk kicked off the event and he focused on tailoring marketing campaigns and online presence to win the moments that matter most. 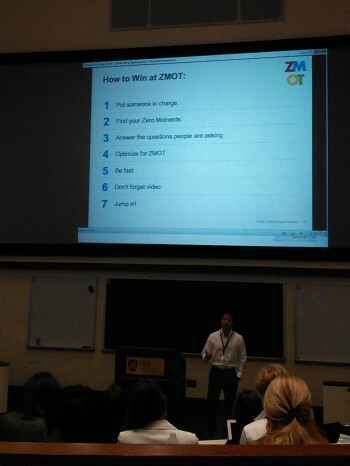 Kim outlined steps to win in the Zero Moment of Truth (link to zeromomentoftruth.com), a concept Google coined to describe how consumers now discover new products and services online. Top on the list: Putting someone in charge. “If everyone is in charge, no one is in charge,” Kim said. Paul Tapscott compares the percentage of time consumers are now spending on mobile devices (12 percent) to an industry average of how much is spent on mobile ads (3 percent). 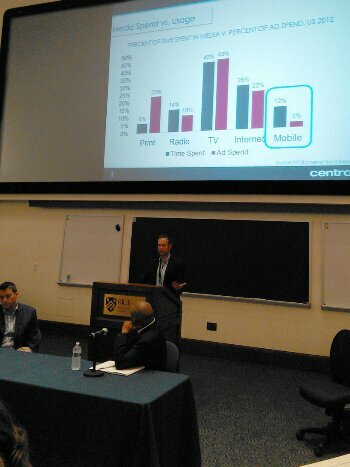 Paul Tapscott, Director of Mobile at marketing firm CENTRO, moderated a panel discussion about the evolved mobile experience. Tapscott presented really great slides about where the industry is right now, and panelists Paul Simmons from Celtra and Brian Kilmer from Paypal Media Network offered colorful antidotes about specific campaigns they’ve worked on and experiences with clients interested in making an impact in the mobile space. – Mobile does some things really well. Others – not so much. – Display interactive HTML5 content within Facebook or Twitter – where the audience already is. You’ll get higher engagement. – Are you helping consumers save time or money? The after-lunch keynote was a panel discussion moderated by HiMA President and University of Houston C. T. Bauer College of Business adjunct Kelsey Ruger. The discussion featured Jay Steinfeld, Blinds.com; Jim “Mattress Mack” McIngvale, Gallery Furniture; Susan Saurage-Altenloh, Saurage Research; and Brent Richey, Tapad. Kelsey Ruger led the panel discussion between Jay Steinfeld, Jim McIngvale, Susan Saurage-Altenloh and Brent Richey. Steinfeld said it is important to experiment without the fear of failure – and he said his company is working to improve the conversion rate of its website on mobile devices. He also said that sending direct mail to lists his marketing efforts didn’t create has never worked. McIngvale said they’re working on making the web as exciting as the store experience, but he said it’s hard to get the monkeys, birds and play area for the kid on a mobile phone. Richey said tablets are changing everything and he stressed the importance of aligning your creative work with your business and marketing objectives. Kluk champions empathy, the acknowlegment that the user is always right, and stresses the importance of an open mind … and scope. 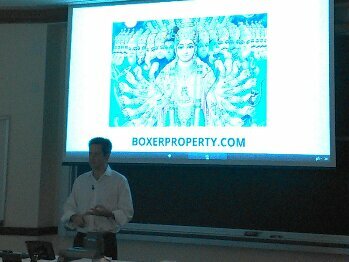 Another breakout session I attended was led by Boxer Property COO Justin Segal – I was interested in this speaker because of my prior experience in the real estate business when I worked in the marketing department at RE/MAX of Texas. Boxer Property is a commercial real estate and property management firm founded by friends in the early 1990s, and its first project was attempting to lease a downtown Dallas office building that had been vacant for six years prior. Segal focused his session on the company’s many efforts to develop interactive apps for mobile devices – at first, they just wanted to be in the app store. “It was a quick and easy tenant app – it allowed us to collect email addresses and allow tennants to send messages to us,” Segal said. Now they’re working on a comprehensive app and website for all of their audiences and needs. 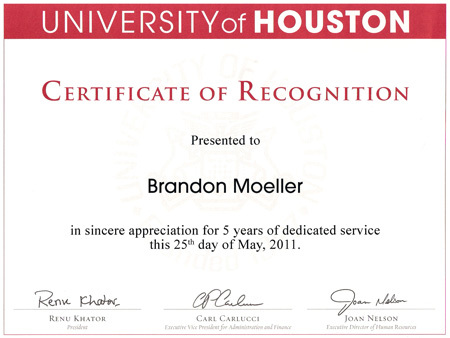 I received this certificate in late June to honor my five years of service to the University of Houston. I began working as an official staff member at the University in 2002, when I served as the Publications Editor for the Journal of Classroom Interaction. After leaving that position to work at four newspapers, I came back to the University as a Web Developer for the College of Liberal Arts and Social Sciences. The University of Houston is a great place to work and I’m constantly inspired by the creative colleagues and professors that I work with as I collaborate on launching website redesign projects and whatever else may come my way. 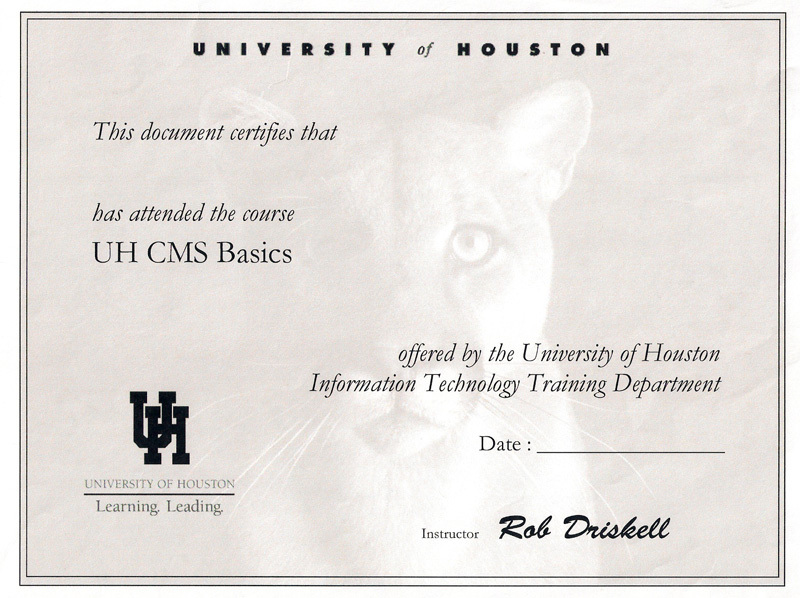 Today, I took the CMS Basics training course, covering the newly purchased Content Management System purchased by the University of Houston. The system is HannonHill Cascade. Today, I completed the Adobe Photoshop intermediate course offered through the University of Houston’s Information Technology Training Department. 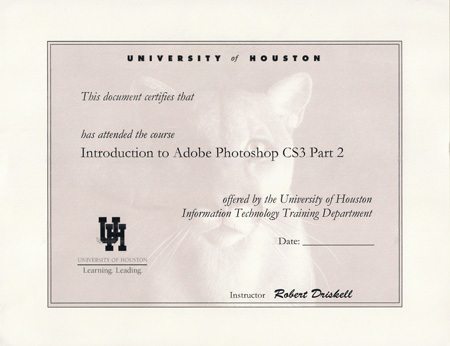 Last week, I completed the Introduction to Photoshop Part II course. The Information Technology department at UH offers free technology training for students, faculty and staff. 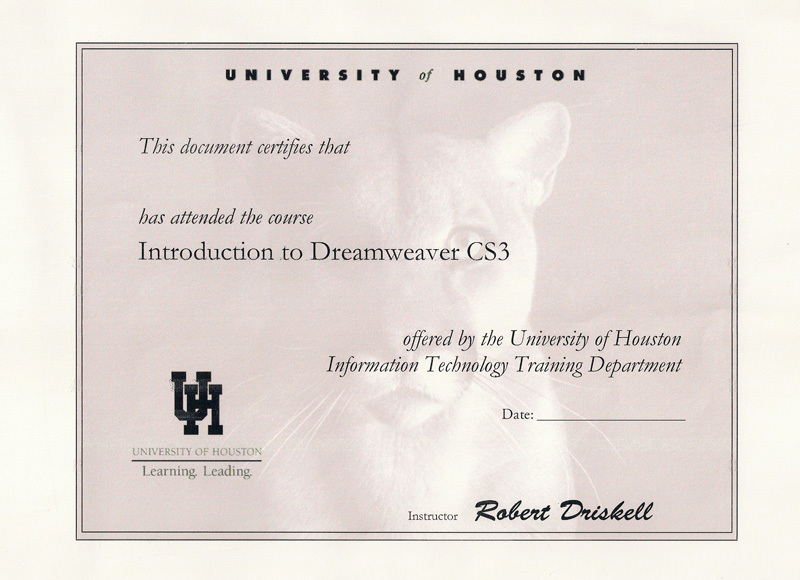 So, I took this class today about Adobe Dreamweaver CS3. Today, I won an award for my reporting of a story about a war veteran and his struggle to rejoin civilian life. 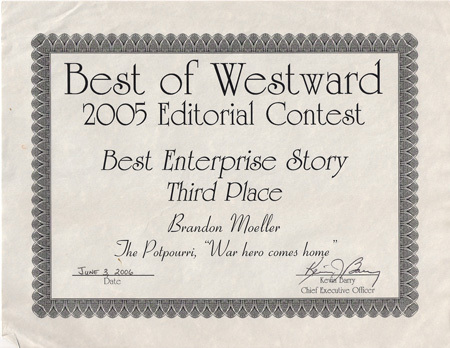 ASP Westward is the parent company of Houston Community Newspapers, which owns the Tomball Potpourri.